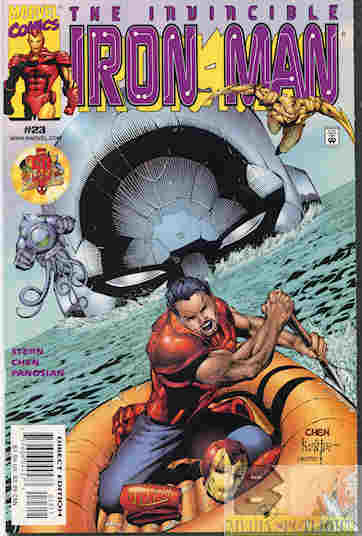 Tony meets with Rumiko on their Stark-Fujikawa’s new research vessel, and surprised to see it being powered by Ultimo! Given his history he’s not convinced it’s safe and ends up in an argument when Rumiko takes Morgan’s side. Later, while visiting Carol, he gets a call that the ship is under attack by Sapper and Golden-Blade, the former flipping out when he learns Ultimo is tied to the ship (although that isn’t why they were there). Warbird wants to help, but she’s been drinking again (believing she needs it to get her creative energies going and only drinks “professionally”) but Iron Man knocks him out, knowing he’s probably going to pay for it later. Iron Man manages to defeat Sapper and Golden-Blade but ends up late for his altered date with Rumiko, which tells her they’re over. At home Tony questions his life with the armor while a consoling Pepper thinks Happy has moved on with his life, and the two end up kissing…as Ultimo awakens! What they got right: It’s nice to see Ultimo show up now and then because he is a decent threat when used sparingly. We didn’t need the “next time” to know Carol is going to come after Iron Man and that story is still interesting. We also see a hint into Sapper’s backstory and his ties to Ultimo, which will be revealed in an issue or two. At the time I was happy to see Tony ending with Rumiko because I really didn’t like her. While she could take charge and be good at it, like we saw in her first appearance, she dismisses Tony’s concerns, sides with Morgan of all people, and yells at Tony for ruining their full-day date. Mike Grell would fix the flaws in her character and make her more interesting, which is on a very short list of things Grell got right during his sub-par run if you ask me, but I’ll get into that when we get there. What they got wrong: Who looks at a giant death robot that wants to destroy the planet, the understanding of which is limited to “we know how to change his size”, and says “let’s use this to power our research vessel”? I’m also not happy (no pun intended) seeing Tony and Pepper hooking up. I know, some of you are used to that now thanks to the movies and it happened later in the comics, but that was after Happy had died in the main Marvel Universe, a decision I’m also not ha…overjoyed about. Am I wrong wanting to see Happy and Pepper back together at this point? Also, Pepper’s doing it again, thinking Happy doesn’t want her (after she’s already gone on at length about not restoring their relationship) and ending up with someone else, only this time it’s one of his best friends (and hers) instead of some guy she knew in school. It makes her look bad is what I’m saying. Recommendation: My problems with this are long only by explanation why, not because I hate the story. It has potential depending on where it goes, except for the Tony/Pepper kiss. Might be worth checking out. Posted by ShadowWing Tronix on February 12, 2019 in Marvel Spotlight, Yesterday's Comics and tagged Carol Danvers, Golden-Blade, Happy Hogan, Iron Man, Marvel Comics, Marvel Universe, Morgan Stark, Pepper Potts, Rumiko Fujikawa, Sapper, Tony Stark, Ultimo, Warbird.